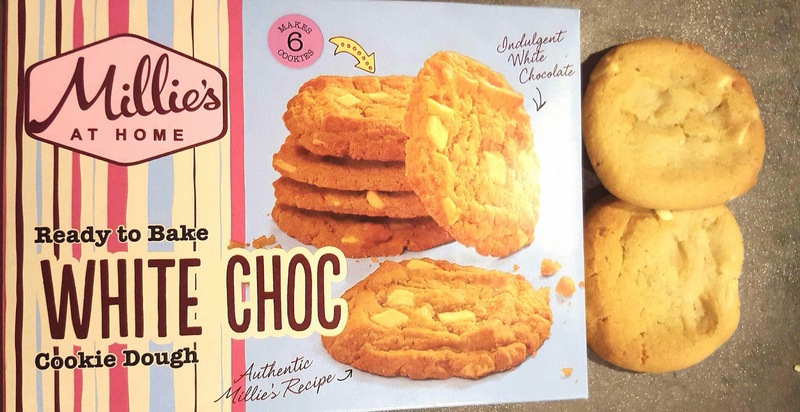 I have always been a massive fan of Millie's Cookies, with fond memories of going into town with my friends to get cookies at the weekend and many giant cookie cakes on birthday's. Whilst my brother was in our local Iceland store, researching for an interview for their placement year scheme, he picked up this box of frozen Millie's Cookies so we could all give them a go. I personally think Millie's cookies has a very distinct flavour and texture, I swear if I did a blind taste test I'd be able to pick them out easily so I was really intrigued to give these a go. There were a couple of flavours to chose from but we went with the White Choc. They were SO easy to prepare, just pop them on a baking tray in the oven (no rolling anything out or messing around with dough), then leave to stand while they crisp up once out of the oven and tah-dahh, they're done. Hand on my heart, you won't be able to tell that these didn't come fresh from the Millie's Cookie's counter. I actually love these ones more! They don't lose the crisp outside and gooey middle that Millie's cookies is known for but these frozen ones are thicker which I love because they feel more indulgent, and having them warm from the oven is just pure heaven. I have 2 cookies in the space of as many minutes and could easily have eaten the whole box! With the highest recommendation from me, if you have an Iceland nearby, you HAVE to buy these!! I must go on the hunt for these, they sound amazing! I need to get myself to Iceland! Millie's Cookie's are the best cookies out there, kudos to Iceland for this one. Oh, now this is a good idea - well done Iceland/Millies! Good to hear the cookies taste like the fresh ones too! Oh my goodness...I love Millie's cookies! I'm going to have to get some of these! I absolutely LOVE millies cookies! Since my nearest one is an hour away I'll definitely be trying these!! Never really go to Iceland so wouldn't have known about these if you hasn't posted this, so thank you!! Oh my god!!! I love Millie's cookies and these sound heavenly <3 I am making it my mission to go to Iceland tomorrow! !